This beautiful and dramatic white dichroic focal has colors of the rainbow shining in it. Its so dramatic and eye catching. Not as big as my usual pieces this pendant is enhanced with sterling silver curls and framework. 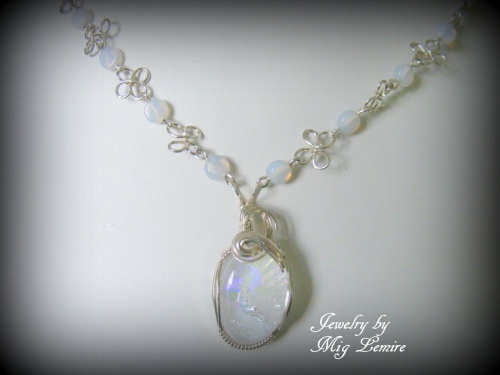 Necklace part has sweet disc like white opalesque beads and sterling silver 4 leaf clover shapes. Piece comes with matching earrings. Measures 17".